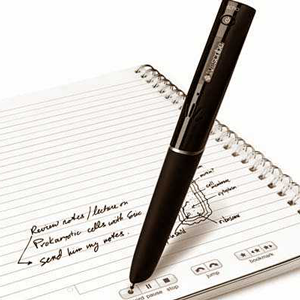 The Echo smartpen from Livescribe records everything you hear, say and write, and links your audio recordings to your notes, so you can find what you need. Ideal for meetings, conferences, or classes. Replay your recorded audio anytime, anywhere, with a quick tap on your notes. Save and Search Using the Livescribe Desktop, you can save notes to your computer. Search for specific words or phrases within all of your notebooks, organize them they way you want, and export them locally for backup or transfer. Send and Share notes or recordings publically or privately as a PDF, audio file, or a pencast. A student can go back to a specific scribbled word in his notebook, touch the pen to that spot and hear a full recording of what the speaker was saying when the mark was made.